Income Ideas | . :Rocky Hollow Gardens:. Today we put together our first cage for our rabbitry. We plan to breed and raise rabbits for food, and as compost/soil creators. We plan to build one more cage identical to this one for the does, and then two more a bit smaller for the bucks. I love our family projects! Here is our progress on the rabbitry so far. We only have to make 2 more cages, and then make the watering system and install it. Posts planted and cemented into place. Strings helping us mark the logs to be cut off level, and also to help us decide where to dig in the center posts. The next 7 images were taken of our progress on 2014-03-30, we got the beams up, siding and part of the roof done. Siding we salvaged from a generous neighbor’s burn pile. Here are more images taken 2014-03-31. 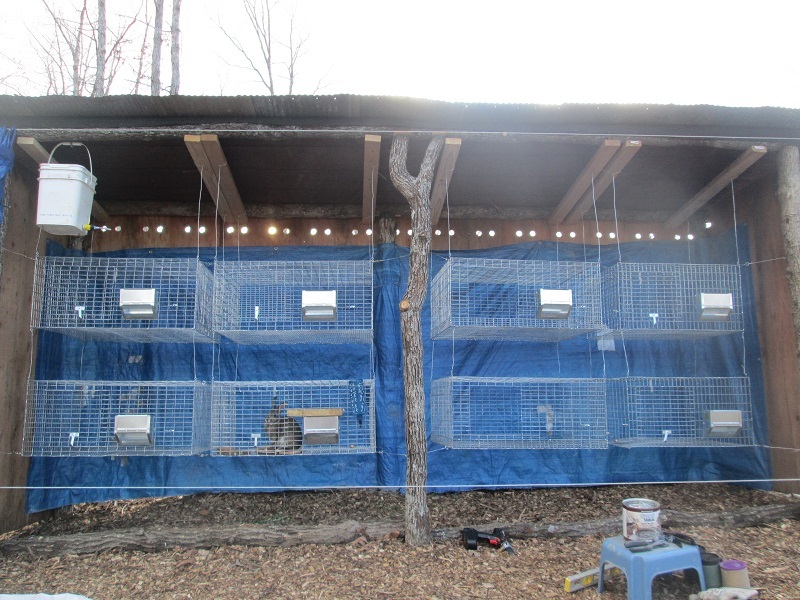 We finished the roof on the rabbitry, and hung some of the cages. Lookin great, and as you see our little pet rabbit, Brownie got to upgrade into a bigger cage. And as of 2014-04-08 this is our progress, we have to install the “poop diverter”, and then the watering system, then get us some rabbits! And as of today 2014-04-16 we have finished installing the watering system, and are ready now for rabbits. In fact Tim is one the phone with the gentleman we will be buying our rabbits from. Probably next Wednesday! SO EXCITED! Here is our rabbitry, all finished! So proud! Here is the watering system supplying water from this bucket to all the cages. From the bottom of the bucket. Here we see the end cages, the ones furthest away from the bucket. And the little part the bunnies lick to get a drink of fresh water. 2014-04-17: The Rabbits are here! We spent most of the day at the awesome home of Hilltop Acres, and got to tour the grounds and see all their critters. Beautiful place, and such nice people! We came home with 3 does we named, Stellaria, Tara and, Violet. And our ginormous kind buck named Tago. We named our rabbits after our favorite herbs that rabbits also like to eat. As I said, the buck’s name is Tago, after one of our families favorite wild herbs Plantain(Plantago spp.). Plantain is easy to find along roadsides, well trodden paths and in lawns. It’s great to use as a poultice for bug bites and stings, and is very nutritious, our rabbit, Brownie always eats Plantain leaves first when we forage for her. One of the does will be named Stellaria, for another family favorite herb Chickweed(Stellaria media). Chickweed grows to be long, juicy and succulent when growing near the base of rotting wood, it has beautiful tiny white flowers. It is delicious in salads or right off the plant. Its great for a poultice for scrapes and cuts, and is also very nutritious. Another doe will be named Violet(Viola odorata), violets grow in shady places, and the more of the delicious flowers you pick the more the plant will produce. They taste sweet and salty, and have a gentle green bean flavor. Violets are very nutritious and are great made into teas and infusions, they are a natural anti-inflammatory and makes a great immunity aid with many other benefits. Our last doe will be named Tara for my favorite Dandelion(Taraxacum officinale). The healing properties of Dandelion are legendary! Very nutritious, the whole plant is edible and medicinal. The flowers can be made into a tea, or vinegar, or even cookies! While the greens are very good as salad greens, or dried for later use in soups. The roots are highly potent healers and are known to be a great coffee replacer. The stems when broken emit a white bubbly ooze that is a healing substance when applied topically to scraps, cuts, warts, moles or bites. Well, with out any further adue here they are! Our Breeding stock! After bringing them home, I realized how very small our pet rabbit Brownie is! These rabbits are huge! To the top left is our buck, Tago. Across from him is Violet, and below her is Stellaria. The doe above our pet Brownie is, Tara. Cute Tago face, this rabbit is HUGE! I have a surplus of Kombucha S.C.O.B.Y. 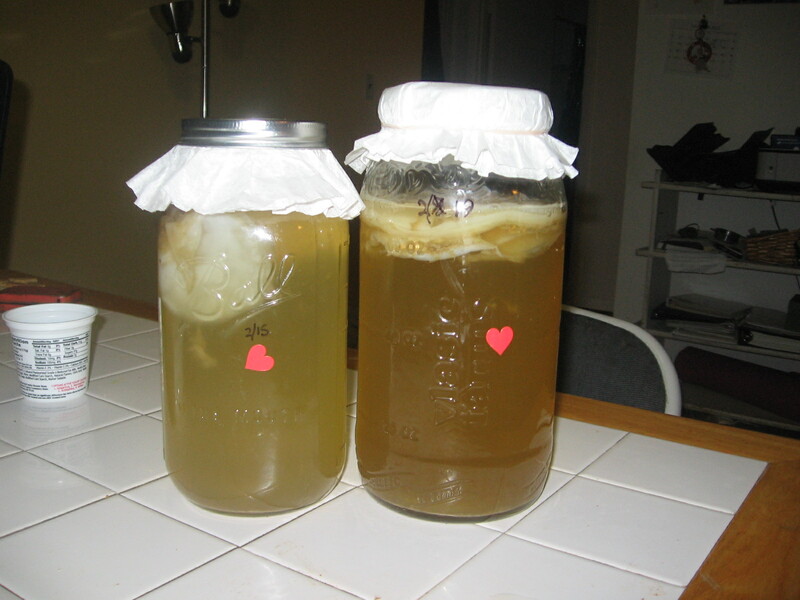 (Symbiotic Colonies Of Bacteria & Yeasts), and starter (finished Kombucha to add to the new batch) I’m willing to share. You can either bring your own container (1 quart or bigger jar, large bowl, zip lock bag etc) and come pick up your new Kombucha starter and SCOBY, or I can ship it to you. If you come pick it up you get this amazingly delicious, probiotic health empowering culture for $5. If you would like me to ship it to you I would be glad to, it will be $15 to cover shipping & packaging. This picture is of my monster batches of Kombucha. These are both 2 quart jars. I brew a lot because I drink a lot of this delicious probiotic beverage. Quart size jar, or bowl. Coffee Filters for breathable lids, or you can use a towel or other breathable porous cloth you have on hand. Rubberband or ring lid to hold the cloth/filter tight to jar to keep flies and other critters out. Setting your Kombucha SCOBY and starter fluid in a safe place out of the way for the moment. Take half of your filtered water and bring to a boil, then pour it in the jar, then place the tea bags in there and let this solution steep till the water cools back to room temperature. Please be patient and let the time pass, allowing things to go slowly brews a superior finished beverage, impatience and Kombucha don’t mix. Then once the water is back to room temp, take out the tea bags and pour in the sugar, stirring till it completely dissolves. 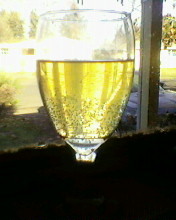 Then put in half of the remaining filtered water and mix. Then pour in the Kombucha Starter Liquid, and then put in the SCOBY. Top it with the coffee filter or cloth, and let it sit out of direct sunlight in a cozy temp of around 70 degrees F. I put mine on a counter in my kitchen, but you can put it anywhere that is safe and out of the way. You don’t want it to be bumped or bothered while it cultures. Let it sit for 7-10 days- then its done. You can leave it sitting up to 30 days, but as it continues to sit and culture, the flavor will get more and more acidic and vinegar like. It’s all about the taste for you. So after 7 days, taste it and see if you feel it’s done. Here are a few links of others brewing Kombucha, so you can get a better idea of the care, maintenance and benefits of having your own Kombucha Culture. All of these ingredients are high quality, wonderful skin nourishing goodness, made with love and gratitude infused energy!